Pour over coffee is meant to be a relaxing experience where you can get the best flavor from your coffee and enjoy making it as well as drinking it. I am a strong believer in choosing the right kettle. See the price on this stylish precision electric stainless steel gooseneck kettle. It is a little expensive but if you love your pour over coffee, you’ll love this high quality kettle. I like to hold a kettle that is comfortable in my hand and well-balanced when I’m making pour over coffee. Call me silly, but I also like my kettle to look good in my kitchen. Some coffee-drinkers aren’t so concerned about the appearance of their kettle but it still rates highly with me. And if you’re considering an electric gooseneck kettle, think about the option of getting a variable temperature kettle with a hold temp feature. This really is the ultimate for anyone who gets distracted before they get a chance to make their coffee! To find the best gooseneck kettle, stovetop or electric, you need to know what you like. If you want to truly enjoy the pour over coffee experience, you need the best gooseneck kettle that suits you. Take a look at these high quality kettles. Whether you need electric or a stovetop kettle, you’ll find one calling your name. And if you need more pour over coffee equipment, take a look here. This gooseneck kettle from Coffee Gator gives you perfect results on all stovetops. It works on gas, electric and induction cooktops (to read about portable single induction cookers, click here). The built-in thermometer makes sure you get the correct temperature every time for perfect coffee. This pour over kettle is made from medical-grade stainless steel with a cool-touch handle. The spout is a special design and gives a smooth water flow. This Coffee Gator pour over kettle features a double layer metal base. It is high quality and will remain rust-free for years to come. Any tips for using a gooseneck kettle on a gas stove? Some people recommend using a diffuser on gas stoves. This is the same for all kettles and espresso makers. The heat diffuser helps to stop the flames damaging the handle and spout of your kettle. If you have a small burner on your gas stovetop then your kettle should be fine without using a diffuser. But, if you need a diffuser they are only a few dollars to buy and you can order one online. They make all the difference when using a kettle on a gas stovetop. The Coffee Gator kettle comes in a 1 liter or 1.2 liter capacity. The manufacturer recommends only filling the 1 liter kettle to about 0.6 liter to avoid overspilling. Similarly, the manufacturer recommends you only fill the 1.2 liter kettle up to the 1 liter level to avoid overflow. Take this into account when you make your buying decision. You may need the larger size. And it’s almost the same price as the smaller version. If you’re looking for an electric gooseneck kettle, you really can’t go past the Bonavita brand. Bonavita has a great reputation for making superb kettles. I love the features on this kettle. It really is the best electric pour over kettle for several different reasons. This electric gooseneck kettle gives you the convenience of choosing the temperature you want the water to be. One of the reasons this is the best electric gooseneck kettle is because it will stop boiling at the correct temperature and hold the water at that temp for up to 1 hour. Tired of keeping an eye on the temperature gauge on a manual kettle? You’ll love this automatic electric kettle because it looks after the temperature for you. You can even pour some water out of it and replace it on the base and keep the temperature holding for an hour to use again later. Is this the best electric gooseneck kettle for present temperatures? There are 6 preset temperatures or you can choose your own in one degree increments from 140 degrees F and upwards. The actual water temperature is shown on an LED display on the base sitting under the kettle. The kettle itself is fully cordless. This electric gooseneck kettle comes in a 1 liter, 1000 watt version. There is also a 1.7 liter, 1500 watt model available. Both kettles are provide a good balance in your hand for pour over coffee. And the spout gives a smooth pour for making great coffee. The exterior of the kettle is an attractive brushed stainless steel. There is a stay-cool handle which is designed for comfort and easy pouring. Being able to choose your temperature in one degree increments and have it hold at that temperature for up to 1 hour really makes this the best gooseneck kettle if you want electric. If you’re looking for the best electric gooseneck kettle consider the Bonavita. Looking for the most attractive electric pour over kettle with variable temperature for tea or coffee? This is the one you’re looking for! This electric gooseneck kettle offers variable temperature with an easy to turn dial to select your desired temperature on the base. The selection ranges from 105 degrees F to 212 degrees F (you can choose Fahrenheit or Celsius) . And if you select the toggle on the back of the base, this gooseneck kettle holds the temperature for you up to 60 minutes – great for when you get distracted! This Fellow Stagg gooseneck kettle is also fast to boil, so you’ll be pouring in no time! The heating element is 1200 watt. This gooseneck kettle has a 1 liter capacity. The precision spout gives you a steady, slow, even pour perfect for pour over coffee. The fluted tip ensures no drip back during or after pouring. The specially designed Fellow Stagg handle is counterbalanced to move the center of gravity back towards your hand. This is a very satisfying kettle to use for pour over coffee. It makes it a pleasure to use. The Fellow Stagg EKG is polished stainless steel inside the kettle with no plastic parts inside. There is only a silicone gasket as the only non-metal component and this is made from food-grade silicone. It seals the electronics from the component that measures the temperature. The base includes a LCD screen showing the set temperature and the real time temperature of your water. This is the best gooseneck kettle for anyone who likes to be precise about their pour over coffee because it includes a built-in “Brew Stopwatch” to time your extraction. This timer is very handy being built-in to the base and ready to go on your counter. This is the best gooseneck kettle for pour over coffee or tea where you want to use variable temperature. The kettle heats water fast and holds it at the temperature you choose making it the best pour over kettle for anyone with kids or pets who is likely to get distracted before they get a chance to make their coffee. If you’re wanting the best electric pour over kettle for convenience and you’re concerned about it being fully stainless steel for your health, this is the best gooseneck kettle for you. Best electric gooseneck kettle – is this really stainless steel only? This Osaka is the best electric gooseneck kettle with a fully stainless steel interior. But, I should mention…there is one tiny piece of plastic protruding into the interior of the kettle and this is at the top where the steam release is located. This tiny bit of plastic is not in direct contact with the water in the kettle. Obviously it is still internal where the steam collects and could result in condensation back into the water. But honestly, it is so small, it really is still the best gooseneck electric kettle in full stainless steel. I’ve not seen anything better in an electric gooseneck kettle. The electric gooseneck kettle shuts off automatically for convenience. This pour over kettle is completely cordless for easy pouring. It’s made with a stay-cool ergonomic handle which is comfortable in your hand. And it’s nicely balanced for pouring. There are two versions available. There is a 1 liter, 1000 watt kettle or a 1.5 liter, 1000 watt version too. This is a high quality kettle with convenience. You’ll really appreciate the gooseneck spout if you’ve ever tried to make pour over with a normal kettle. It’s hard to find a fully stainless steel electric gooseneck kettle for making pour over coffee. Now you don’t need to compromise. The Osaka is the best electric pour over kettle with a completely stainless steel interior. This modern stainless steel gooseneck kettle is stylish and functional. It works on gas, electric and induction stovetops. If you’re looking for the best gooseneck kettle to match modern décor, this is it. The handle is specially weighted to shift the center of mass closer to your hand when you pour. This counterbalanced handle is perfect for making pour over coffee. The spout is designed to pour at the optimal pour over flow rate. There is a thermometer built-in to the lid on this pour over kettle. The thermometer sits flat on the top of the lid and doesn’t interfere with the stylish appearance of this gooseneck kettle. The thermometer is accurate and includes a red zone as an optimal brewing temperature range. The surface on the outside of this pour over kettle is matte black. The matte black appearance gives it its stylish look. But if you want a more metallic look, it comes in polished stainless steel or copper as well (see below for the copper version). The Fellow Stagg is the best gooseneck kettle for modern style but it also offers great features with the weighted handle and precision pouring spout. Just one note of warning about this kettle. Some people have used this on their gas stove without having a small burner to place it on. If you do this you’ll damage the surface, handle and spout. This is the same with all gooseneck kettles. If you don’t have a small burner on your gas stovetop I recommend purchasing a diffuser so the flames don’t damage your kettle. A heat diffuser is only a few dollars but will give you peace of mind when using smaller pots or a kettle on your stove. This Zell stainless steel gooseneck kettle is a timeless design making it perfect as a gift. Anyone can use it on gas, electric and induction cooktops. The interior is fully stainless steel. The exterior is a stainless steel mirror finish. This kettle is perfect for pour over coffee with its thin gooseneck spout. There is a large stay-cool handle with slip-resistant grip to make pouring effortless. This is the best gooseneck kettle for a gift because it is attractive yet functional. It works on all types of burners making it versatile. If you know someone who loves coffee, this makes a great gift for their pour over coffee. You could even pair it up with a pour over coffee maker, or a cone dripper, or a pour over stand. Throw in a packet of coffee beans and you can make it a complete set. Another gift idea is to buy a few pour over coffee items (including coffee beans, filters and stirrers) and put together a DIY coffee gift basket. This works because it makes a pretty present and you know it’ll be appreciated. A pour over coffee gift is perfect for teachers, neighbors, parents-in-law, anyone who loves coffee. And good thing is, you can personalize the gift for each person with their favorite coffee beans or an appropriate mug. Enjoy choosing a coffee gift for all your friends and family. And you can start with this pour over kettle. This gooseneck kettle looks great in copper. It’s the same kettle as the one mentioned above in the “Best Modern Style” category (to see the matte black version, click here). The copper color gives it a completely different look for your kitchen. If your kitchen has decor touches of copper in it, you’ll love this kettle for making pour over coffee. You can leave it on the counter and let it add style and color to your kitchen. The handle is weighted to provide easy pouring and the handle is coated so it doesn’t become hot. The built-in thermometer is included in the lid on this pour over kettle. This is the best gooseneck kettle to make a relaxing cup of pour over coffee in a stylish kitchen or office. It’s easy to choose the best gooseneck kettle for yourself once you know what’s available. 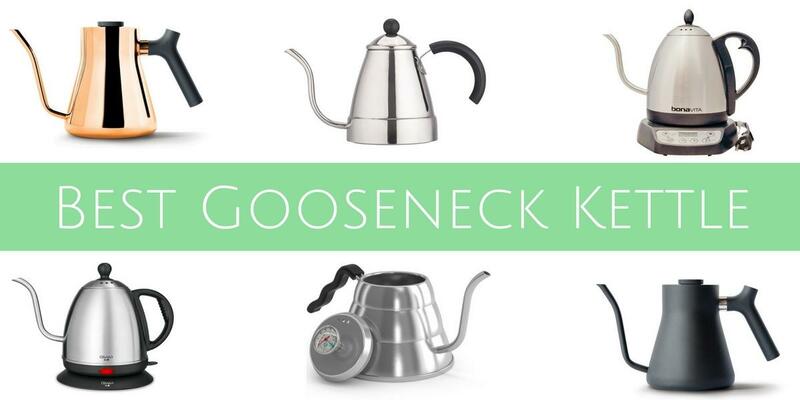 And a gooseneck kettle makes a perfect gift for any coffee-lover. But if you want to give more, consider a coffee gift basket. You can personalize the gift to include the items you know that person will love. It’s easy to start with a basket and place the items inside. ☑ Looking for a new induction cookware set? ⇐ See everything you need to know here. ☑ Curious about Instant Pot? ⇐ See more here. ☑ Do you need a portable induction cooktop for a RV, dorm room, holiday house or as an extra burner when entertaining? For all the details you need, click the link.